Healthcare employees are a diverse group with unique requirements. 24/7 shift arrangements complicate budget restrictions, and job roles magnify compliance issues. Is there one employee scheduling solution for healthcare managers that is up to the task? 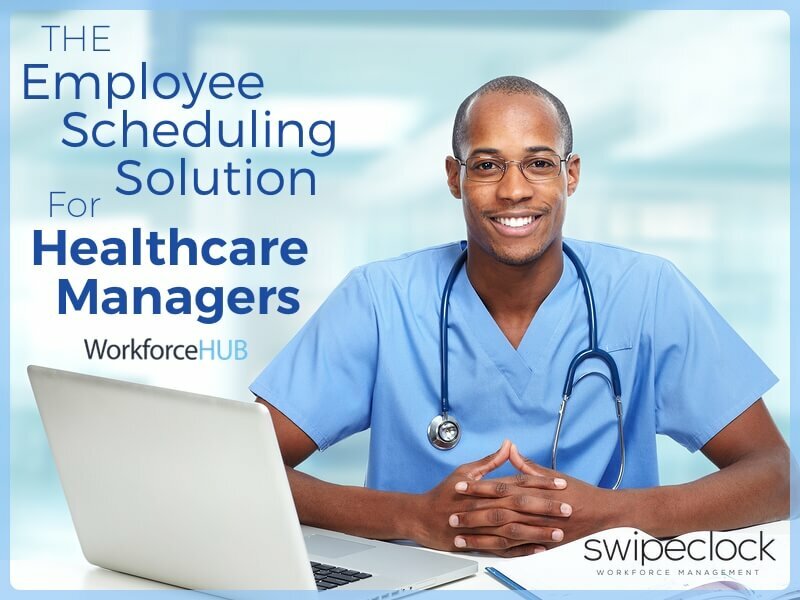 SwipeClock WorkforceHUB™ is the employee scheduling solution for healthcare managers. A wide array of user features allows employees to concentrate on work. Efficient management tools make WorkforceHUB a capable solution for overwhelmed managers. Healthcare is a complex industry. There are legal and compliance issues, medical knowledge requirements, finance and care concerns. Employees have specialty skills but must fill many roles to meet job expectations. Limited budgets and legal restrictions offer a tight working space for managers. Without the right tools, managers are often overwhelmed with scheduling complications. The problem becomes an issue of which scheduling software to adopt. WorkforceHUB is scheduling software that provides solutions in 7 critical areas. Addressing these areas helps establish WorkforceHUB as the scheduling software solution for healthcare. WorkforceHUB provides a single scheduling solution to solve every problem for healthcare managers. Scheduling software doesn’t have to be complex to be complete. Easy Scheduling: you don’t want to spend extra time trying to figure out how to manage your software. Payroll Based Journal: don’t let compliance issues bring you down. Overtime Warnings: you have enough to do than worry about who is available to cover shifts. Mobile Access: give your road warriors the freedom to clock in during house calls or at remote sites. Self-Service: empower your employees to take some of the load off your shoulders. Document Management: post critical information with automatic readership tracking for worry-free staff educating. Payroll Integration: tracking time and attendance doesn’t have to stop before payroll. If your scheduling software isn’t handling these seven problems, it’s time to upgrade. Let’s get the first one out of the way: your scheduling software should help you schedule. It should be easy, fast, and efficient. WorkforceHUB features schedule templates that help you create new schedules in seconds. Need to adjust? No problem: click-and-drag employee names or job roles to fill empty shifts. You can even create new templates from new schedules. Easy. WorkforceHUB scheduling software is easy to use for small or large workgroups. Our scheduling solution is scalable to fit any sized organization. We serve the largest hospitals and the smallest patient care homes. Healthcare managers in any organization will find advantages in our scheduling software. Custom scheduling modes let you schedule by employee name, by job role, group, or location. Whatever makes sense for your organization, we can handle it. Efficient scheduling helps you save time as a manager. Wouldn’t you rather be doing something else, anyway? WorkforceHUB scheduling software makes it easy to schedule your healthcare employees. Payroll-Based Journal is a critical compliance rule in healthcare. As a manager, you need to track specific skills to assure coverage. WorkforceHUB helps you fulfill your PBJ duties with role-based scheduling. You can assign roles to each of your employees and define coverage needs. Alerts will show you where you have empty gaps, and templates will make them easy to fill next time. WorkforceHUB also tracks your PBJ and creates a compliance history. In the event of an audit, you are always ready with an accurate report. No more worries about reporting or assembling complex records. WorkforceHUB has you covered with automatic PBJ tracking. Another critical area of healthcare schedule management is overtime. Managers are under constant pressure to keep budgets tight and expenses low. Scheduling is one of the areas in which you can save the most, but it often gets overlooked. When you change schedules, add employees, or allow shift swaps, you risk over time. Unplanned overtime can swamp your budget or cause gaps later in the period. Our system has an automatic alert to warn you when a schedule will generate over time. We’ll flag employees who are approaching overtime limits. You won’t have to do any quick calculations or miss an opportunity to save. Your budget will remain intact, and you’ll avoid overtime restrictions on your schedule. Our overtime alerts help you save unplanned overtime before it happens. Healthcare isn’t restricted to hospitals and care centers. Mobile employees comprise a large part of our healthcare workforce. Managers need an effective way to track employees on home visits or remote locations. You need mobile scheduling software. WorkforceHUB allows full access to clock-in and clock-out functions. It also provides access to the hub for schedule swapping and profile maintenance. All on the go. Mobile healthcare employees are better representatives when they feel connected. Our mobile scheduling software allows constant connection and interaction. Even better, our mobile scheduling solution provides remote management features. Employees aren’t the only ones on the road; sometimes managers are mobile, too. Managers can access schedules, approve swaps, and watch the workforce in real time. From any location! You’ll never feel disconnected again. Employees will know you are on the job, even when you aren’t at the job. Employee Self-Service is a healthcare industry miracle. With so many diverse employees and job roles, it makes sense to empower employees to take part. Managers shouldn’t spend valuable time on routine maintenance and employee account upkeep. Employees can do that for you. Employee Self-Service lets employees log into the WorkforceHUB to interact. Interactions include updating their profile and tax exemption status. That alone will save you countless hours of interruptions. Employees can also make their own schedule requests or volunteer for open shifts. As a manager, you only need to make simple approvals. As we have discussed, overtime alerts will assure you aren’t going over budget. PBJ tracking and alerts will warn you when job roles are missing from scheduled blocks of time. Your job will be a lot easier with Employee Self-Service. Our scheduling software includes ESS as part of WorkforceHUB. Document management and scheduling are a unique consideration in the healthcare industry. Regulations in our industry motivate us to document certifications, continuing education, and experience. WorkforceHUB provides document management between managers and employees. As a manager, I can upload a document such as an employee manual, and I can track employee readership. This can be a big help in scheduling because I can post a document for certification in the hub. I can then track the employee’s readership and completion of the document. When an employee finishes a document, I am notified. The system will apply a certification or achievement to their profile. This qualifies the employee for a job role in my scheduling software. Now I have more resources to fill job role-based scheduling. Document management allows for expanded management options that enable me to better schedule. In the end, I can schedule faster and with greater accuracy. Job roles help fill gaps and meet PBJ requirements. Managers produce better schedules in less time, and employees have confirmed skills. Thanks, Document Management! The purpose of your scheduling software is to help you manage your workforce. Your workforce fills shifts and records time. Payroll integration is a critical end-result of scheduling. Without payroll integration, scheduling software is only doing half the work. WorkforceHUB includes payroll integration. Your scheduling software talks to your time and attendance recording. Import time and attendance data into Payroll with a simple step. Payroll Integration with scheduling software saves time and helps you avoid mistakes. WorkforceHUB is the employee scheduling solution for healthcare managers. It covers the seven most critical aspects of healthcare management, and a lot more. If you would like a brief demo of WorkforceHUB, contact SwipeClock or any of our 1000 Partners. Learn more about WorkforceHUB and how it can help manage your healthcare workforce.